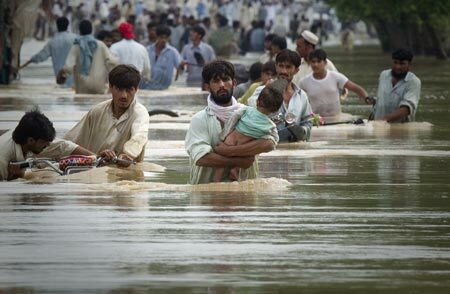 The worst floods in Pakistan's history have hit at least 14 million people, officials say. Twelve million are affected in Khyber Pakhtunkhwa and Punjab provinces, while a further two million are affected in Sindh. In Indian-administered Kashmir, at least 113 people died in mudslides. Meanwhile, it has emerged that a charity connected to a group with alleged al-Qaeda links has been providing flood relief. Flooding has submerged whole villages in the past week, killing at least 1,600 people, according to the UN. And the worst floods to hit the region in 80 years could get worse, as it is only midway through monsoon season. According to the federal flood commission, 1.4m acres (557,000 hectares) of crop land has been flooded across the country and more than 10,000 cows have perished. 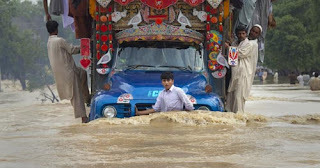 A UN official, Manuel Bessler, told the BBC that with crops swept away by floodwaters, some Pakistanis could be forced to rely on food aid to get through the winter.